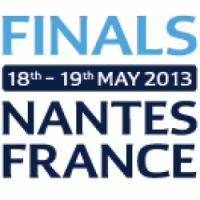 The EHF is to test a new goal line technology system at the EHF Cup Finals in Nantes, France on 18 / 19 May 2013. The system developed by the Handvision Association, in collaboration with the French Handball Federation (FFHB), uses a special wide-angle camera fixed to the crossbar to give a complete picture of the goal line. At the request of the referees it will now be possible for decisions on the awarding of goal to be checked on a video replay - and to answer the question as to whether the whole of the ball has crossed the line. Fans following the game in the arena will not have to wait long for the decision, if the referees ask for assistance from the goal line technology, the game will be halted and the referees will watch the video reply provided to them by technicians next to the timekeepers table. The system is designed to provide the referees with more complete information in certain goal line situations, the final decision on the awarding of the goal remains with the referees. Video replays will not be used for any other match situation by the referees. The system has been successfully tested at international matches in France, including the women’s cup final in France and will also at the Coupe de France in Bercy, Paris on 25 May 2013.